Criminal lawyer Marta Richter is hours away from winning an acquittal for her client, millionaire businessman Elliot Steere, on trial for the murder of a homeless man who tried to carjack him. But as the jury begins deliberations, Marta discovers the chilling truth about her client's innocence. Taking justice into her own hands, she furiously sets out to prove the truth, with the help of two young associates. In an excruciating game of beat the clock with both the jury and the worst blizzard to hit Philadelphia in decades, Marta will learn that the search for justice isn't only rough - it can also be deadly. Lisa!! You've written plenty without all the vulgar language! Way too much cursing! Wow! The story was riveting and kept me on the edge of my seat as Marta went her adventure! The reader...she was good except she needed a ricola with krrutta craaft! And the huge pauses of dead silence between chapters deserves a do over! I struggled to get through this book and could not finish it due to the profanity used throughout. I didn't think the used of all the bad language was necessary, it ruined it for me. Lots of slippery clues during this snow storm. It was fun to visit these justice seekers once again. I was absolutely sucked into the story. I had to agree with others that the F-bomb was kind of overdone. I know it is out there and under extreme stress it might be considered appropriate for the characters but at times it was distracting to me. I would not let that keep from a good listen and a pretty exciting story. The narrator is one of my favorites which also added to the experience for me. The story was very good but the pauses between the chapters were too long. I find myself constantly checking to see if the recording had stopped. Also there was too much swearing. I listen to my audiobooks in the car. After getting several dirty looks, I learned I had to keep my windows up while listening to the story. the long silent pause between each chapter was very distracting and very annoying, I suggest correcting this. I liked the plot, but I was saddened by the overuse of unnecessary profanity. It was a distraction. 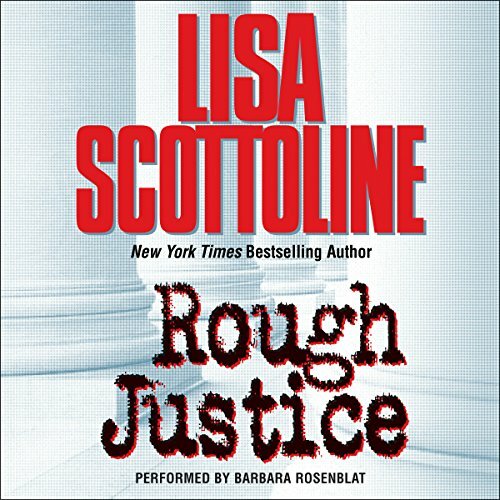 I am a huge fan of Lisa Scottoline, but this book was very disappointing. If I had not spent so much money on it I wouldn't have finished listening to it. The series is based on an all women's law firm that deals with criminal cases. In this book, the defense attorney finds out that her client is guilty after the jury goes into deliberations. She sets out to prove that he is guilty before the jury renders its verdict of " not guilty" . I don't need to explain why this is ridiculous. Secondly, the language is extremely offensive throughout. Also there is a blizzard taking place during the story and the attorney is outside wearing heels. I am glad this was not my first Lisa S. book because it would have been my last. Didn't love this. I just couldn't connect with anyone properly and although I liked Marta I didn't like the ending. This book had great twists and turns. It did drag a bit in the middle but it was still a worth while listen.